Understanding the Journey Our Fish Take from Farm to Tank. We all know what the tanks look like in a store, but most aquarists don’t know what everything else in the industry is like. I hope this article helps shed some light on this otherwise unknown world that our fish are very familiar with. 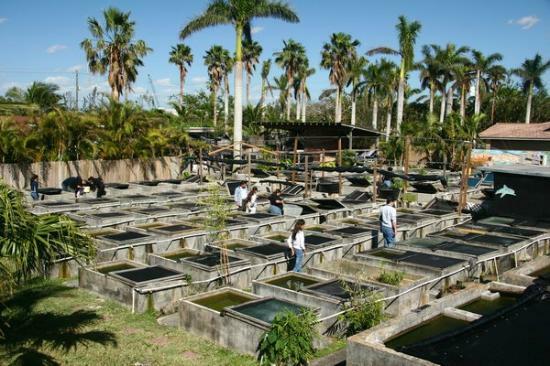 Most freshwater fish start out on tropical fish farms. 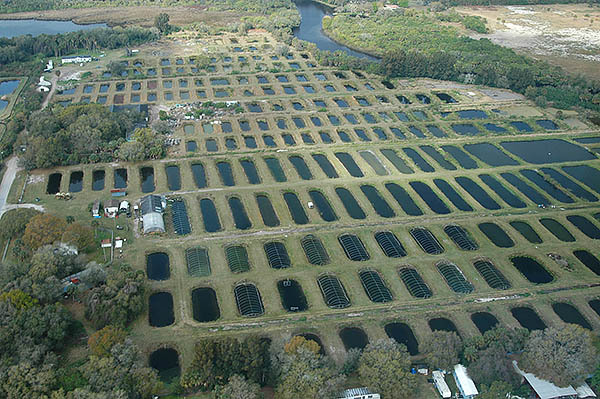 Most fish farms are in Florida or Asia. These are areas that are warm enough to house tropical fish outdoors. They may be housed in giant tubs the size of swimming pools, smaller tubs that are hundreds of gallons, or large earthen ponds dug in to the ground. Feeding and water changes will vary from farm to farm. Some get a good amount of natural food (outdoor earthen ponds), others will use generic flakes and pellets, prepared seafood mixes (grind up fish fillets, add a vitamin mix, etc.). Most fish that enter the hobby are quite young, as little as a few months old. They only need to grow large enough to sell in a store. This generally means colored and large enough to identify as well as large enough to live in normal tanks. Keep in mind, all the fish are raised on the same farms. Maybe some farms alter some water, but overall they are all in the same water. The same temperature, the same pH, the same everything. This goes for tetras, African cichlids, goldfish, everything. Most goldfish haven’t been kept as cool as room temp until they are in your tank. They were raised in the tropics, held in warm warehouses, held in your retailer, and then put in your tank at room temp. Obviously there are still a good amount of fish that are wild caught. These vary a lot more than farms, but a good picture of how this works goes as follows: Local people around the area (South America, Africa, Asia, etc.) make a living collecting the fish. They catch them and bring them to holding sites. These holding sites may be a low end warehouse, an outdoor area of tubs and vats, etc. They are then packed, transported to an airport, and flown to an importer. Almost all saltwater fish will follow this path. They are caught by locals, held for (usually and hopefully) very short periods of time, packed, and shipped to an importer in the U.S.
Wild caught fish are almost guaranteed to bring in pathogens, especially parasites. Most live with internal parasites, which is normal and they are okay with it as long as they aren’t too stressed and eat well. It is when they are stressed that the parasites aren’t kept in check that they become damaging to their hosts. This is one reason why getting them to eat quickly is so important. The sooner they start eating well the less stressed they will be and the better they will settle in. Most fish raised in Asia or wild caught will go to an importer facility before getting to a regular wholesaler. Most are in Los Angeles or Miami. 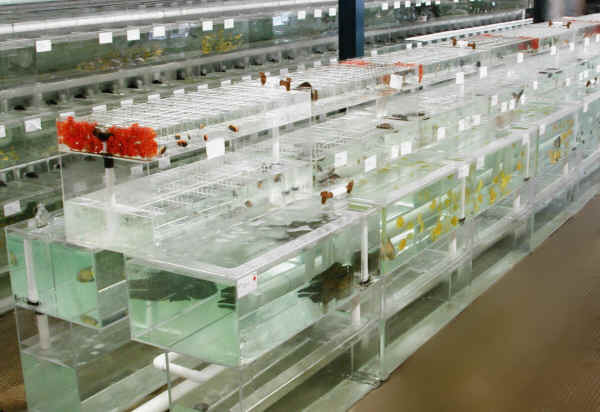 These are large facilities with tons and tons of tanks for housing all sorts of fish at the same time. Feeding is usually pretty light at this point. Most fish don’t want to eat after such a journey. You also don’t want to overload the system with a massive load of fish and then feed the heck out of them at the same time. You also don’t want to fill them up just to have them release massive amounts of waste the next day when they are being shipped again. The tanks are usually at room temp which is kept warm enough to keep the tanks warm (not fun to work in). This is the same for the wholesalers and even some stores. Many importers also serve as wholesalers. Most sell to wholesalers and will sell directly to local stores as well (although they may have a much higher minimum order than a wholesaler). Wholesalers are who the local stores and big chain stores buy their fish from directly. These are usually in small warehouses or industrial sites with lots of tanks. Some use central filtration (usually multiple systems) while others use individual filters (usually air powered such as filter boxes or sponge filters). They use air powered filters because they are easy and super cheap to maintain, and you can run the entire place on one or a few large air blowers. Again, feeding is usually relatively light. Water changes will vary from one wholesaler to the next. They are likely to do a lot because the bioloads per tank can be excessively high. Tanks at wholesalers will be densely stocked. This may mean a whole box of neon tetras in a 40breeder or 29. A box can be hundreds of fish. This is extreme, but it is very short term, they are barely fed, and water changes are massive. The tanks will be anything from 10-55 gallons or even large tubs. The wholesaler I went to has mostly 40breeders and 29s, with a good assortment of other sizes. So they could handle anything from some cherry shrimp to 2′ kois, pacus, or catfish. The final step before going home to your tank is the fish store. We all know care in fish stores varies widely. Some do great water changes, others don’t. Some feed the best foods on the market, some feed whatever they can get the cheapest per pound or for free for carrying a certain brand in their store. Our store had central filtration systems. This meant the whole system was very stable and could handle the big swings in bioload as fish are sold and new shipments come in. This is much more stable than running tanks individually. The water would drain from the tanks in to a sump, and was then pumped into a pond bead filter, through a UV sterilizer, and then to the tanks. The water couldn’t get from one tank to another without going through the UV (although there was probably too much flow to actually kill all the pathogens). Our systems ran very well and the fish thrived. We fed New Life Spectrum to all the freshwater fish. The saltwater fish got it too, but we had them mainly on frozen foods because they were all so new (probably in the ocean days to a week before they got to the store). Water changes were at least weekly. I would do about 50-80% water changes on all the systems. We algae wiped daily so the tanks looked good for customers, but we used bristlenose plecoes in almost all the tanks to do most of the work. Losses were very minimal. I have worked at other stores that pulled 10-30 or more fish per day (sometimes multiple times per day). We would pull 0-5, maybe 10 right after a big shipment. When we received new fish we would turn off the lights, float the bags, open them up to add water, pour the bags through a net and add the fish. We would keep the lights off for the rest of the day (or at least a few hours if we could before we actually opened), and feed. Feeding right away meant the fish knew they would be fed well and would distract the other fish from bothering new additions. Shipping from one step to the next is almost always done overnight air freight. The fish are packed in pure oxygen so they can actually go 2 or more days without real issues (such as when they airline ‘misplaces’ the boxes, puts them on a truck to a different state, flights get delayed, etc.). How long they spend at each step can vary. Once they leave the farms it can be as little as a half day to a week at each step. When I used to go and hand pick fish at the wholesaler we went on Tuesdays because that is when their shipments came in. If you waited even just a day or two the selection was horrible. The fish had usually just arrived that day or the day before, probably not fed yet, and we had to pick the best. For no good reason bad batches happen. This may be a batch of neon tetras that for no apparent reason just all die off shortly after arrival in the store. Maybe it is the next day, maybe it is over the next week, but it happens. The best explanation is that for some reason that bag of fish was stressed and that caused them to go down. Maybe they were packed too densely in a bag during one of their shipments. Maybe the water they were put in was too cold or too warm. Whatever the reason, you can get a bad batch. This is outside of the store’s control and occurs at the best store, wholesalers, and importers. It can be minimized, but it happens. The usual batch of fish will lose no fish, or maybe one or two at the most. So the batch where all the fish of one type go down is obvious and stands out as an exception. In our store we would happily stand behind our fish. We knew which ones had issues and which didn’t. If we had a bad batch of a certain fish and a week or more later a customer said they bought one and died, we replaced it with no hassle (even well beyond our usual guarantee). Keep in mind that the fish that make it to your tank lived through all this. They have gone through a lot and survived. Some fare better than others, but they made it. So if fish die shortly after coming in to your care it usually means one of two things: either the stress of this long journey caught up with them, or their is something wrong with your tank.